In the past few years, I have read and heard the word ‘blockchain’ a considerable number of times. Although to date, widespread blockchain daily use remains just out of reach. But when it comes, we are going to party like it’s 1999 for sure. For anyone who has been on a retreat in a remote jungle for the past ten years, blockchain is computer programming invented in 2008 Satoshi Nakamoto to serve as a public transaction ledger to manage the trading of the cryptocurrency Bitcoin. The challenge for Bitcoin was to create and maintain a secure financial trading platform for trade, with no centralized server or authority, to oversee and manage the transactions. Nakamoto filled the need. Blockchain is an expandable list of data records called ‘blocks’ linked together using cryptography, connected blocks, and timestamps. As each transaction occurs, a block of data is created, timestamped, connected to the previous block, and ready to be connected to the next block creating an unalterable ‘paper trail’ of sorts. The system allows contributions by users such as recording transactions between two parties but does not allow retroactive changes to data. The result is a digital distributed ledger used to execute and record transactions. Blockchain is considered secure by design and is managed by equally privileged peer to peer networks collectively adhering to built-in protocols. There are no less than one thousand additional things I should be saying about blockchain, but since I would have to research what they are, I am not going to attempt to explain further what is well above my head. One thing I, and many others, do recognize is blockchain can be a contributor to the speed and efficiency of doing business. What now can take days and multiple separate transaction efforts on different platforms, could be reduced to a fraction of the time on one platform with much less effort. Everyone seems to be playing with blockchain, but there is a reluctance to commit by major companies. The reasons for the caution are understandable. Sure, everyone wants to know a secret, inquiring minds want to know. Everyone wants to keep a secret too. Companies are unenthusiastic about joining a public blockchain system including all of their competitors. Trade secrets and proprietary information are highly guarded commodities by most companies. Connecting to, and strutting their business efforts, on a publicly visible blockchain ledger gives them the feeling they are leaning into a left hook. The alternative is utilizing private blockchain technology and never letting it leave the house which would diminish some of the magic of blockchain. Yes, while blockchain is designed to have security ‘baked in’ to its structure, there remains no completely infallible program exposed to the internet. Blockchain is not immune to hacking. In Just two examples, according to global powerhouse *‘Hedge Coin Group’ https://thehedgecoingroup.com/ in August 2017, a group calling themselves ’51 Crew’ attacked two blockchain clones called Shift and Krypton. The hackers took control of 51% of the network. Also reported by The Hedge Coin Group was a $65 Million in digital currency heist from Hong Kong-based ‘Bitfinx’ https://www.bitfinex.com/. We only need to think back to 2017 to recall A.P. Moller-Maersk’s nightmare that stopped their world causing reverberations throughout the transportation industry and the global flow of cargo traffic. Theoretically, if the transportation world where all participants in a single open blockchain platform, successful hackers could hold the hold world hostage. The free and continuous flow of goods and services is paramount to our societies wellbeing, and in some cases, very survival. For much of what we use every day to live, there’s no going back to goods sourced locally. In August 2018 I wrote a piece titled **‘Blockchain is cool, but give it time.’ In the article, I highlighted the above reasons as to why widely used blockchain trade is, and would remain, on the horizon for more time than most people expect. Instead, I saw the transportation industry stepping up their technology in other areas to increase visibility and collaboration with shippers. I am not alone in the view I wrote about in August. An article published in the Journal of Commerce (JOC) https://www.joc.com on February 01, 2019 titled ***‘For Shipping: Visibility via data trumps blockchain’, expresses about the same logic. I am not going to say I, and the JOC, are wrong, but we may not be right. What is the answer? I am glad you asked. One company thinks the answer is a free-standing hybrid blockchain driven platform. Hybrid blockchain splits the difference between ‘open blockchain and ‘private’ blockchain. While vetted and approved traders within the group would benefit from the speed and efficiency of the internal open blockchain platform, the hybrid blockchain platform would stop at the door. The company is ‘TradeHelp’ https://tradehelp.org/ based in the U.S.A., and they have big plans. 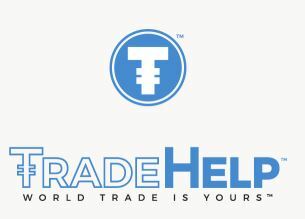 TradeHelp describes themselves as the “World’s First Live Trading and Services Eco System for All Types of Commodities, Goods, Products, and All Commercial Trade Services.” With this kind of billing, I just had to find out more. With the help of Mr. Gary Kesser, one of the founders of TradeHelp, I did just that. Mr. Kesser (Gary from here on out) is excited about TradeHelp. Despite Gary speaking in terms that make my face go blank like ‘trading eco system,’ ‘proprietary algorithms,’ and ‘iCloud Saas,’ his message to me was clear. The TradeHelp blockchain platform will allow traders of all sizes to transact business securely on a level playing field. Moreover, the site will not be limited to traders. Service providers like 3PL’s, 4PL’s, Customs Brokers, stevedoring, NVOCC’s truckers, surveyors, trade financiers, commercial banks, freight forwarders, and even cargo insurance companies can bid on shipments needing services. The larger the membership for the TradeHelp platform becomes, the more universal the blockchain becomes within the group. Any approved party can post their offers for others to bid on, or bid on other offers in the blockchain environment. Pretty cool stuff. Gary had my attention. There was a short video on their website home page explaining TradeHelp. While the video was great, I wanted to know more. I asked Gary how deals would execute in their blockchain system? He did not tell me, he was kind enough to show me. Not only did Gary let me look inside what future traders would see, Gary had a ‘test account’ set up for me (TJO Cargo) in TradeHelp for me to play with just like if I were a trading member; this was too cool. In the test environment, I viewed offers and deals. Since I was given the green light to play as I wished, I found a shipment needing cargo insurance and bid (Quoted) on it filling in my terms and conditions. The system registered my bid and showed me as the lower bidder. Before long in my TradeHelp e-mail box was an alert the buyer had countered my bid $10USD lower than my initial offering. I had the opportunity to accept, reject, or counter, I accepted the bid. I then began to wonder what happens now? As luck would have it, there was someone on the other side who saw me confirm I was ready to sell, and they awarded me the business. Within what seemed to be a New York minute a contract/purchase agreement showed up for my review. The agreement had all the pertinent information from the system auto-populated and was ready for me to e-sign if I approved. I then added what additional clauses I believed were needed to the agreement and sent it back to the buyer for review. We agreed on the terms and conditions and closed the deal. From finding the service request to quoting the business, negotiating final terms and rates, signing an agreement both the test environment buyer and seller (Me) agreed on, and it all happens within the TradeHelp platform. What wasn’t included were phone calls, e-mails, faxes, sending bank wire information, or credit checks. I couldn’t have bought a fake Rolex watch on Canal Street in New York City any faster. While TradeHelp touts a long list of benefits, some of the things that stood out to me with the system are related to speed, parity, flexibility, and task centralization. For my test transaction in the system, things moved fast. Instead of an elongated process, I felt like I was striking a deal sitting across the table from the buyer armed with magical contracts that populated with whatever we said. While no trading platform can make the undecisive decisive, the platform mitigates the barriers of prospecting, validating, and dealing with multiple organizational players. This system can be a true mano e mano trading environment with no doubt. The platform is truly a level playing field for all members. It’s no secret the vast majority of trade is by small to medium-sized companies. These small and medium-sized traders sometimes find themselves at a disadvantage compared to their larger counterparts for global resources. In contrast, TradeHelp’s platform gives each member an equal foundation with none having an advantage over the other. The flexibility of the system is also impressive. While the use of the platform can be cradle to grave for the complete lifecycle of a deal in TradeHelp, there is no such thing as a ‘hostage deal.’ If two traders are midway through way through a deal in TradeHelp, they can pull the deal out of TradeHelp at any time to finish the deal outside the platform. Member traders are also able to bring deals hatched on the outside world into the platform to take advantage of the systems tools. One of the real pearls in the system is an unlimited number of buyers can list all of their different needs in the same platform and maintain one hub of operations. In the example of a soybean buyer looking for 100 tons of soybeans, the buyer could post RFQ’s and close deals for the soybeans, the transportation or even separate transportation legs, cargo insurance, Customs Brokerage, stevedoring, surveyor, and last mile delivery all in one place. Even Walmart can’t do that. My frolic in the TradeHelp system was limited to what is called ‘Gen I’ of the platform. Yes indeed, there is a ‘Gen II’ coming soon. Later this year they will be rolling out ‘Gen II’ which will bring even more toys like post-trade functions of physical execution flow and settlement to complete the package. The wait for traders and service companies to trade on TradeHelp’s blockchain trading platform won’t be long. The complete platform is scheduled to fully operational in 2019. While no one can say the platform will be the trading model of the future, as for me, I will be keeping an eye how the TradeHelp effort develops. Even though the system is still currently under development, there were enough operational tools for me to have fun and be impressed. Since I have told you all of what I know about the TradeHelp blockchain trading platform, you will have to contact Gary Kesser about the finer details. You can contact Gary via e-mail at gary@tradehelp.org or his team info@tradehelp.org for more information. If you are LinkedIn kind of person, you can find Gary at https://www.linkedin.com/in/gary-kesser-1b50687/ to review his profile.